Do you remember watching parents with their children pre-child days? Yeah, I’m talking about as you walked through the store alone seeing that mom bending over negotiating with little Tommy or Sally about the chocolate bar or Tonka truck. The next aisle over you saw the mom that has the kid throwing a tantrum in the middle of the aisle or the one that looks like she’s about to bust a blood vessel. That, One. Mom. That one that appeared to be so patient and loving no matter how many times Tommy said no kicked or hit her. That “PERFECT MOM!” She was your ideal mom. She’s the one you wanted to be like when you had children. She smiled at you and told you, “he’s just tired and has never acted this way before.” And you believed her. Well, I’m not that one. But, I do classify myself as a “perfect mom.” My lovely daughters make me want to drop kick them at times, and I’ve succeeded not to do so thus far. I consider myself a perfect mom. Yea, I said it. Don’t send the blog police after me, just hear me out. My family consists of three daughters ranging up to preteen years, so my expertise covers to preteen life. When I meet new mothers I try not to give my unsolicited personal parenting advice, simply because those days were painful with everyone telling me how to raise my children, however, I do now understand and appreciate some of the unwelcoming advice provided. But, when you ask my parenting advice be ready to receive it. I always start out with, “there’s no perfect parent!” The perfect mom isn’t that one walking around talking about how much she loves her little Poptart that never does anything wrong. Hmmmm….did you forget we attended the same playdate yesterday? Your Poptart is BAD! That’s a cover up. She really wants to tell you that she wants to run away for a week, maybe two! The perfect mom keeps it REAL! She will say she wants to run away and hide. That pleasant little grin on that face as she slowly leans into that sweet little child is followed up with the words “you have three seconds to get yourself together, or Mr. Leather is about to come out to play.” And when you ask her what she’s smiling about she will tell you that she’s about to jack her child up! The perfect mom will have things out of place in her home. Pause, this isn’t giving a pass to have an unkept house, but things aren’t always perfect. My kids showed me this video. I laughed until they told me this is how I behave. We laughed even harder. HAHAHAHAHAHAHAHA Why? Cause I’m a “perfect mom” and this is the kind of craziness we do. The perfect mom doesn’t have all the answers to parenting, she makes mistakes, she wants to run away; she wants to tell her kids to be quiet or even SHUT UP and heck, sometimes she just doesn’t want to parent! She may serve donuts and ice cream for breakfast, take the kids to Burger King 3 days out of the week. But, one thing for sure is, she LOVES her family! I am the poster child for A PERFECT MOM! Thank you for reading. We get too wrapped on what perfection really is and forget we are perfect being and managing our home our way. Once there is unbridled love in a family – whatever the make up – that is perfection. At least to me. Great post. You nailed it. Absolutely. Thank you for this. The kids were super happy that morning. This was so good to read, I loved reading and watching the little video. LOL. We get a little crazy sometimes. Moms are epitomes of patience, at least the perfect ones are. 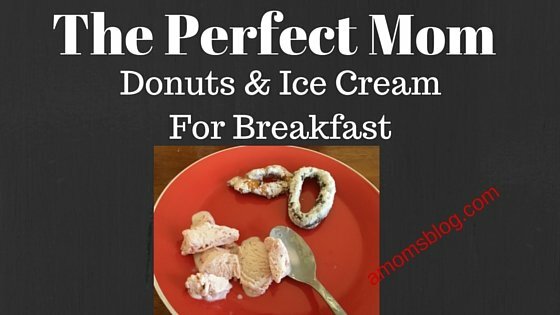 Donuts and icecream would be a great breakfast idea. Ouch – That video reminds me of how I acted sometimes when I was expecting company. 🙂 My 5 kids are all grown up and we’re the best of friends. I guess I did something right along the way. At least I’ve always kept it real. Love the video! If that’s the case then I am a perfect mom too! We shouldn’t question ourselves on how we raise out kids, we try to do what’s best and that it, no judgement needed. Thanks for the good read! We should definitely cut moms some slack, they do the best that they can with what they have! I know this was meant to be sarcastic or funny, but it speaks so true to how moms really feel! Yes. We do the best we can and love. OMG! Hilarious video! I think I’m a perfect mom too!! Such a wonderful post & I loved that great video as well, which could relate me very much being a mom of 2 kids. Honestly everyone wants to be a perfect mom & patience is what gets you there. Oh my gosh, this is so right on and the video, yes that craziness has went on at my house! Thanks for reminding me to keep it real!